Originally posted: March 31, 2019 . Last modified: April 1, 2019 . 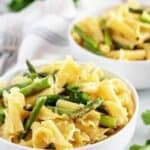 Our favorite garlic asparagus pasta recipe made with fresh asparagus, garlic, olive oil, and Parmesan cheese. A delicious dinner in less than an hour! As you may have noticed, we recently published a sauteed asparagus recipe. 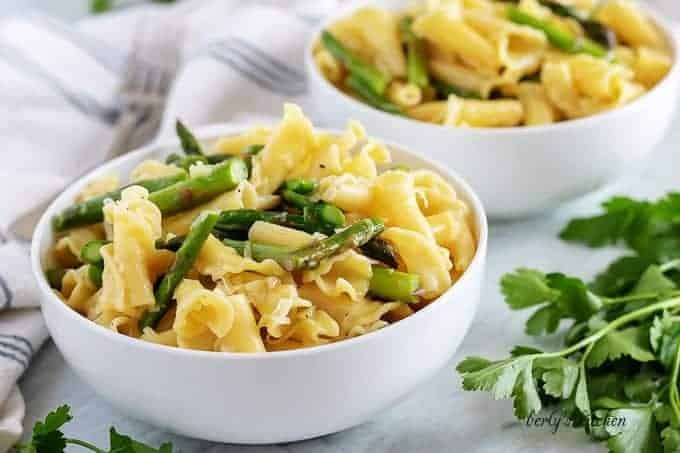 Since we had some of the fresh veggies leftover, Kim and I decided to share my garlic asparagus pasta recipe. I’ve been making it for a few years now. Originally, the recipe was a great way to get our son to eat asparagus. Those of you with children understand how challenging it can be to get kids to enjoy vegetables. Well, it turns out adding butter, cheese, and pasta works pretty well. I also use that formula for my broccoli mac and cheese. While it might not be the most, “health conscious,” way to incorporate vegetables into a diet, by God it works. How about we get cooking? Personally, I consider this recipe to be extremely simple. The hardest part is the prep work. Begin by boiling the pasta. Of course, you want to use the package instructions. However, I always add salt to my water. Doing so, will properly flavor the pasta and reduce the amount of salt added later on. Once the pasta is done, drain it and set it aside. It’s time to work on the asparagus. 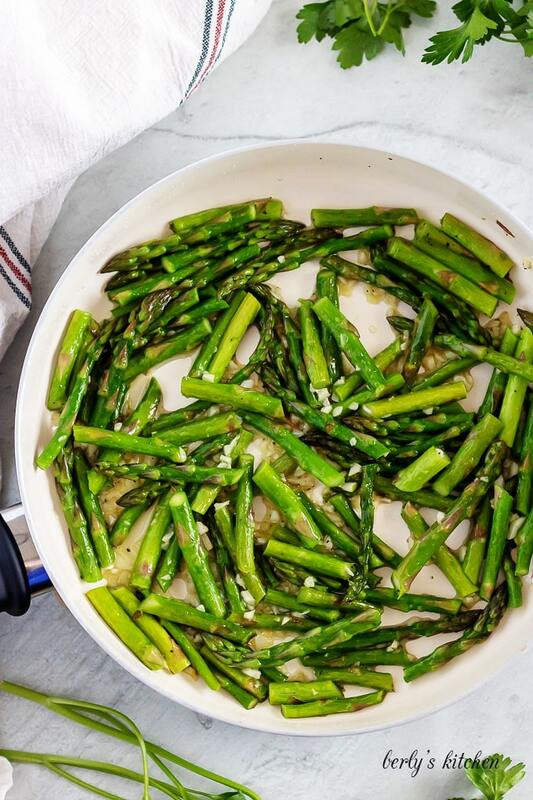 In a large saute pan, over medium heat, combine the chopped asparagus, olive oil, and sea salt. Let them saute for about seven (7) minutes, then add the minced garlic. Don’t overcook your garlic. The minced bulb only needs about a minute to a minute and a half to saute. At this point, you can add the butter to the pan. Once it’s melted, remove the pan from the heat, and toss the drained pasta to the pan. I mean that literally, put the noodles into the pan and give them a good toss. This step ensures that your asparagus pasta is properly coated in the butter and olive oil sauce. After you’ve coated the noodles in sauce, top the pasta with grated or shredded Parmesan cheese. 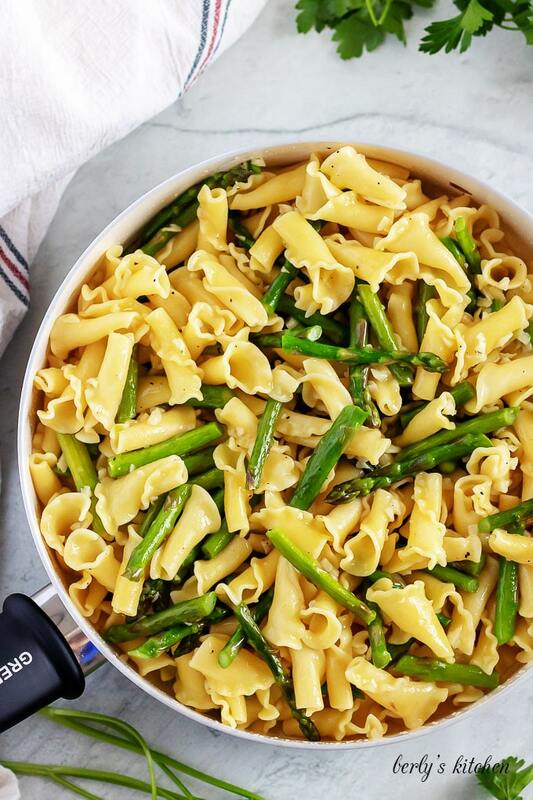 That’s it, your garlic asparagus pasta is done! Serve it and enjoy your meal. So, not everyone loves the butter and olive oil combination. If you want to remove the butter but are afraid of losing flavor, then try drizzling fresh lemon juice over the pasta. It add a fresh kick of citrus to the dish. Another way to flavor pasta is to boil it in broths or stocks. Whether you choose beef, chicken, or vegetable, your going to add an extra layer of flavor to the asparagus pasta. Give it a try sometime. If you want to add a protein to the pasta, then I recommend chicken. You could season it with an Italian herb blend and that would mix perfectly with the garlic and olive oil in our dish. 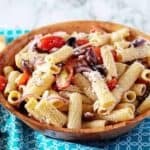 Looking for more pasta dishes? 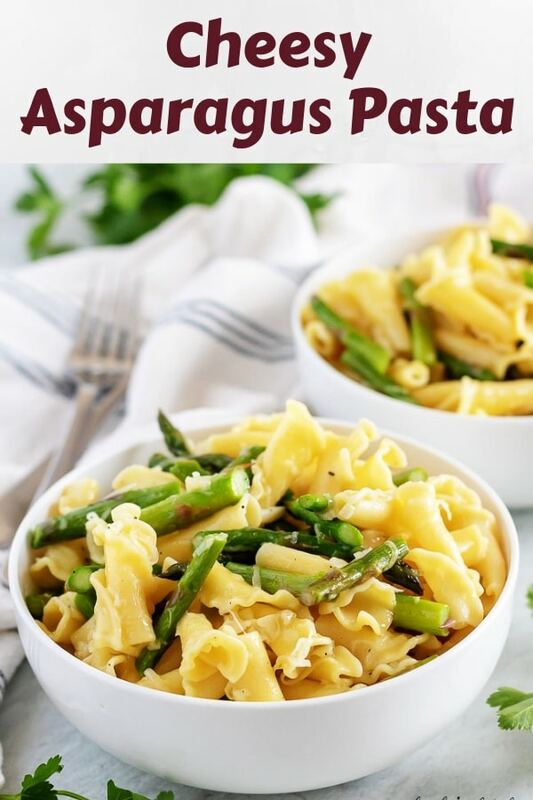 If you enjoyed our garlic asparagus pasta recipe, please leave us a comment and rate the recipe card. You can also find us on Facebook, Pinterest, Twitter, and Instagram by searching for Berly’s Kitchen! Boil the pasta per the box instructions. I use salted water, about a fourth (1/4) of a cup of salt in the large saucepan. Drain it and set it aside. Wash, dry, and chop the asparagus into bite-sized pieces. Place it into a large saute pan, over medium heat, with olive oil and salt. Saute it for five (5) to seven (7) minutes, then add the garlic. Let everything saute for another sixty (60) seconds. Add the butter and let it melt, then add the pasta to the pan. Turn off the heat and gently toss the pasta and asparagus to coat them in the butter and oil mixture. Top the pasta with Parmesan cheese and serve. 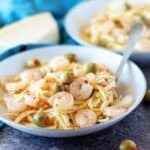 The calories listed are an approximation based on the ingredients and a serving size of two (2) ounces of pasta with one-fourth (1/4) of the veggies and sauce. Actual calories will vary. 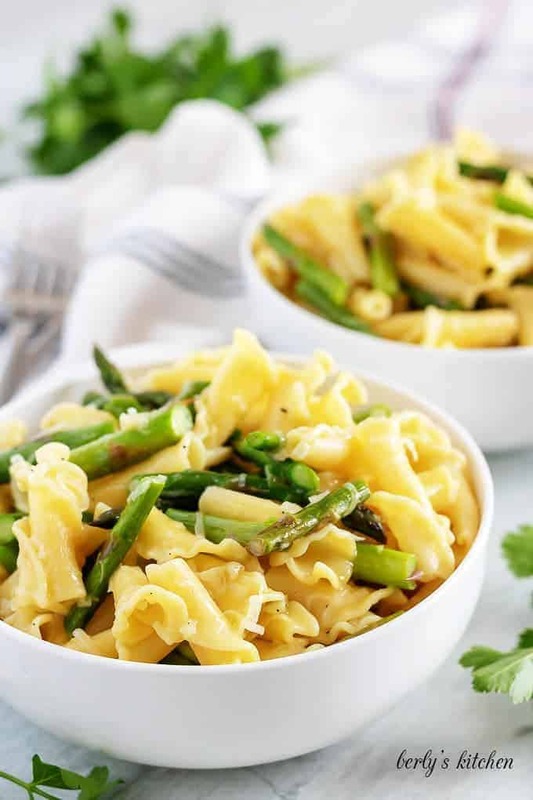 The asparagus pasta can be stored in your fridge for up to three (3) days.